Fast fashion is a process that certain companies follow within the fashion industry to produce affordable and fashionable clothing for customers. Within fast fashion, since clothing is manufactured so quickly, retail locations are provided with specific, customer-targeted clothing articles every day or every few days. Fast fashion gives a wider socio-economic range of consumers the option of purchasing the newest and trendiest clothes at a more affordable price compared to purchasing designer clothes which look similar but are sold at a far more expensive price. There are two key elements contributing to the success of "fast fashion": price, and a continuous supply of fresh, popular garments. As such, success requires an interesting combination of artistry and humility on the part of the product designer, as well as a clever and discreet eye for emulating others’ work. Certainly some companies have been subject to lawsuits over the years for alleged intellectual property infringement. Still, the major players in the industry march on. Behind the scenes, a faster supply chain from product ideation through delivery is imperative. The era when it was acceptable to manage twelve (12) to eighteen (18) month product lifecycles is over. Consequently, it is in a company’s best interest to have a good demand forecast engine to help decide how much of a particular item to make and/or buy for shoppers. The amount of clothing that individuals purchase has increased over the years, partially due to cheaper retail prices. With the availability of cheaper apparel, people are able to afford more items and are inclined to purchase more. Individuals from the United States purchased an average of 40 clothing items per person in 1991, while an average of 63.7 clothing items were purchased in 2013. These facts illustrate how the fashion and retail market has changed over the years as well as how businesses were able to increase their amount of sales. Fast fashion is a contemporary term used by fashion retailers to express that designs move from catwalk quickly to capture current fashion trends. Fast fashion clothing collections are based on the most recent fashion trends presented at Fashion Week in both the spring and autumn of every year. Emphasis is on optimizing certain aspects of supply chain logistics for these trends to be designed and manufactured quickly and inexpensively to allow the mainstream consumer to buy current clothing styles at a lower price. This philosophy of quick manufacturing at an affordable price is used in large retailers, including Zara, H&M, and Uniqlo. Fast fashion particularly came to the forefront during the height of Vogue’s "boho chic" aesthetic in the mid-2000s. This has developed from a product-driven concept based on a manufacturing model referred to as "quick response", which was developed in the United States in the 1980s, and moved to a market-based model of "fast fashion" in the late 1990s and first part of the 21st century. Several global companies believe the concept of fast fashion is a successful method to run their business. Notably, Zara has been at the forefront of this fashion retail revolution and their brand has almost become synonymous with the term. However, there were other retailers who worked with the concept before the label was applied, such as Benetton. Fast fashion has also become associated with disposable fashion because it has delivered designer product to a mass market at relatively low prices. Fashion is always changing and trends rarely extend for a lengthy period of time. As trends and clothing styles change, customers don’t have to worry about spending a significant amount of money on clothes that will only be worn for a short amount of time. One reason why fast fashion has been successful is because companies are normally in control of the whole process from start to finish. Rather than buying clothes from manufacturers, businesses are directly involved with designing, manufacturing and shelving clothes. With the availability of new technology, such as advanced computer and analytic systems and manufacturing equipment, companies are able to complete an entire process of developing a product in a more efficient manner and faster amount of time. The use of updated and modern technology allows for the accurate decision on what design should be produced, the quantity of a design and the efficiency in the amount of clothing that can be manufactured. Inditex is one of the world’s largest fashion retailers who is responsible for creating Zara, as well as several other retail businesses. Established in 1975 with headquarters based in Spain, Zara is a popular retail company that has store locations all over the globe and is well-known for utilizing a fast fashion business model. In 2015, their sales and profits significantly rose by 15% from 2014 which goes to show that this business model has been successful for the brand. A large reason why Zara is so successful is due to the small amount of clothing produced for each design. Since new styles are made every so often, Zara doesn’t have to follow long term fashion trends. Designs can be completed within 4-5 weeks and existing garments can be altered within 2 weeks. The company analyzes short term trends which make it easier for analysts to determine if a trend will be successful or not. Due to Zara being in charge of their own manufacturing they can decide to increase or decrease their operations to meet customer demands. Each week Zara responds in real-time to customer preferences as they emerge. Zara is able to introduce new clothing designs at a rate of approximately every two weeks, which provide customers with a total of approximately 11,000 distinctive items each year. 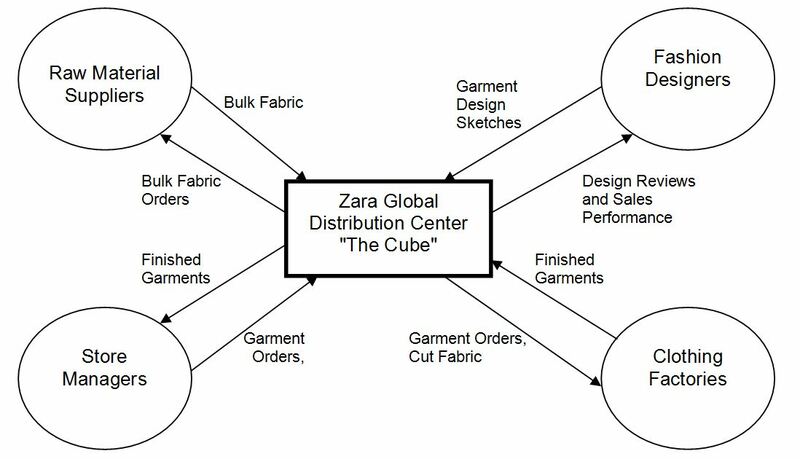 Zara’s owns a large distribution center referred to as “The Cube” which is where a majority of significant activities occur for their supply chain activities. All of Zara’s business activities end up reverting back to The Cube, including ordering raw material from suppliers, creating new sketches and designs, production of garments, and sending apparel to the stores and receiving feedback data from customers. Zara’s supply chain involves a constant movement of information. Zara’s headquarters contain teams who are responsible for obtaining a large amount of information on new fashion styles and trends. Major teams consist of design, sales, and procurement and production planning who work closely with one another to create and produce new clothing lines. Designers from the design team collaborate with one another and examine newly developed sketches for potential products. Sales personnel are responsible for communicating with store managers and obtaining customer feedback of new designs. Procurement and production planners create estimates for manufacturing costs and capacity. Ultimately, all of the teams work in conjunction to analyze design prototypes in order to choose a final design. Throughout the entire process, certain tools are utilized to develop the proposed designs and analyze and keep track of large quantities of collected data. Computer aided design (CAD) systems are used to assist in choosing the appropriate colors and textures for garments. The specifications of each design are sent directly to equipment within Zara’s factory and bar codes are used to track the pieces of material and determine to which store they are delivered. This team-oriented approach rapidly reduces cycle response times and allows for distribution to local stores at a phenomenally improved. H&M is a recognized Swedish-based apparel retailer which focuses on high fashion and low price strategy, and operates retail stores in over sixty one (61) countries. Another pioneer of fast fashion, H&M is known for quickly adopting new apparel trends. H&M focuses on investing in responsiveness to customer feedback and desired fashion trends in order to strengthen the brand name and promote sustainability. Whereas Zara offers apparel that is aimed towards adults, H&M offers clothing for all ages, including infants, children, and adults. This brand provides a range of clothing options for individuals of any age, widening H&M’s market opportunity. With a wider range of customers, utilizing the method of fast fashion allows this company to provide a variety of affordable clothing to their customers. Founded by Erling Persson as Hennes & Mauritz in Sweden in 1947, H&M has mainly engaged in sale of clothing and cosmetics. Due to its retail size and international scope, logistics are extremely integral to H&M's operational approach of creating the ideal product in the necessary quantities and routing those items to the optimal retail sales location. As both an importer and retailer, H&M must monitor every step of the supply chain, and update the information technology required to support continuous, efficient operation thereof. Rather than maintain its own factories, H&M outsources production to independent suppliers in Europe and Asia. The benefit of Asian-based production is a massive reduction in costs, while the European producers usually provide much more rapid manufacturing-to-market response, which allows H&M to deliver more popular items quickly to the American and European markets. H&M also employs a unique distribution technique, which provides different options based on market region and item demand. In normal production, the clothing items are delivered directly to the central warehouse located in Hamburg, Germany, and then distributed to stores as requested by management. However, if the item is being produced for a specific regional market and consumer segment, the H&M system allows the products to be re-routed directly to specific stores in order to meet local demand in a timely fashion. H&M’s supply chain is supported by an advanced IT system that connects all of their stores, production offices, administrative offices and headquarters in real time. Central inventory management software is utilized as well to keep track of inventory allowing H&M to analyze the trends and sales of their clothing. At H&M’s headquarters, more than one hundred (100) designers work on analyzing current fashion trends and then four hundred (400) other designers work on creating H&M designs for these fashion trends. Due to fast fashion's nature, H&M's inventory turnover is extremely rapid. Generally, the value of an individual garment depreciates 0.7% per day, resulting in a 7% loss of value every ten (10) days. As such, the faster the item sells, the higher the gross profit margin that will be realized for that item. Utilizing demand trends on a store-by-store level, H&M's central logistics system can track sales of each item through ICT (information and communication technologies) in order to avoid a sales backlog from excessive production, and, resultantly, a decline in gross margin realized per item sold. Additionally, H&M also utilizes flexible procurement as the core of its supply chain management. H&M's buyers procure new designs and items on a monthly basis rather than once or twice per year as the traditional fashion model would dictate. Relying heavily on internal ICT, H&M monitors purchasing and sales in tandem, and each retail location can monitor others' sales and product allocation, allowing replenishment whether via new product or transfer of existing product. Essentially, H&M utilized ICT to create a closed-loop feedback system which links sales, inventory, procurement methods, and product capacity metrics to promote complete transparency and encourage sales by reallocating and replenishing product as necessary. Certain high-fashion designs are made in a smaller quantity so that in the event that these items aren’t as popular there won’t be a surplus of apparel in inventory. The Company operates twenty (20) sourcing offices which work with numerous suppliers around the world to ensure that products are sold at a fair price and delivered within a certain amount of time. The time it takes to produce products differs depending on the location; it can take 2-3 weeks in Europe whereas it can take up to 3-6 months in Asia. Based in Japan, Uniqlo is another company that is seen as a brand that utilizes the concept of fast fashion. Although the company offers basic fashion styles to customers, all their clothes provide low-priced comfortable clothes that are made of innovative materials. Uniqlo holds concept meetings each year to discuss upcoming developments and design concepts for clothing lines. The R&D department researches popular styles and analyzes new materials to for future designs and then work on modifying prototypes to develop the final designs. Uniqlo can afford to sell their high quality items at a low cost by directly working with material manufacturers and securing large orders of materials. After working with R&D personnel, the merchandising team has to plan the product lineup and decide the volume of each clothing item that should be produced. Through quality and production control, customer concerns are taken into account to implement future product improvements. The company invests in high quality materials and is involved with a large amount of research and design. One of their most popular clothing lines is HeatTech where the R&D team researched innovative materials to create a lightweight heat retaining fabric. Uniqlo spends a significant amount of their time working with Toray Industries who produces the synthetic fiber to ultimately improve the material for their HeatTech line. The concept of "fast fashion" and the supporting industries are uniquely qualified to take advantage of the economic benefits of the R&D tax credit. Specifically, this area incorporates both structural design of garments and the information technology systems necessary to track and supply consumer demand in a manner designed to maximize gross margin return. Additionally, logistics means and methods become essential to deliver efficient processes. As such, nearly every aspect of the "fast fashion" industry, aside from retail sales, represents development of new or improved products and processes. In the increasingly competitive and fast paced fashion industry, the R&D tax credit is an added economic boon that should be maximized by every fashion-oriented company seeking to increase its economic stability.